SANZAR today announced an 18-man strong referee team for the 2013 Super Rugby competition. 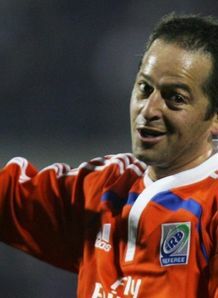 The announcement includes five new referees to the Super Rugby circuit, including Argentinean Francisco Pastrana (pictured, who controlled his first Super Rugby match in 2012). The team includes the Southern Hemisphere's top performers, with Craig Joubert, Steve Walsh and Chris Pollock (returning from injury) heading up a strong team. "The recent form of some of our referees in the Test environment has given us an excellent senior group within the team, and we have been able to include a healthy number of young referees," SANZAR Game Manager Lyndon Bray said. "They have been selected with an eye to the future, both for Super Rugby and Test rugby." Along with the Argentinean Pastrana, Australia's James Leckie has been recalled to the squad, while Rohan Hoffman (a former professional rugby player), Jason Jaftha from South Africa and Nick Briant from New Zealand get their first taste of Super Rugby with their selections. "Along with the five new referees introduced to Super Rugby in 2012, we have a very strong nucleus of younger referees, blended with some of the best in the world at the top of their game."